I go on movie buying binges quite a bit, especially when used dvd stores have deals. $2-$5 dvds? sign me up for 6. and then 5 more next week. I’ve had at least three quite significant movie binges in the past few months. And of course I haven’t gotten around to watching most of them. But I was sick on Thursday and decided to sit down and watch “Fly Away Home”, since I’ve been wanting to watch it ever since I bought it. I loved this movie as a kid. It is one of those that starts out really sad, but you know there’s a happy ending waiting for you. Watching it now, I paid a lot more attention to the music than I did before. The song “10,000 miles” by Mary Carpenter definitely strikes the chord it’s meant to. My favorite parts of the film are some of the difficult moments. When Amy is in the shower and squirts soap in her eyes. All of Amy’s sarcastic remarks at her dad. These are building blocks of the characters that I really enjoy. I love that Amy is this child lost in a strange world of adults. The film shows very little interaction with other kids. She doesn’t have lots of friends. She is different. The film truly is made by the main characters, Amy is Anna Pacquin, who went on to be Rogue in X-men (and is in true blood, apparently too, but IMDB had to tell me that). Dana Delaney plays Susan, Amy’s dad Thomas’s girl-friend. Thomas is played by Jeff Daniels. Thomas’s brother David and friend Barry are pretty much there for comic relief (though Barry serves as eye candy as well). I’ve been watching a bunch of movies from my childhood lately and it’s crazy to think that the environmental movement hasn’t moved further, considering how many 80s and 90s movies focused on it. Fly Away Home, Fern Gully, Secret of NIMH. All have a definite environmental slant. In the movie, Amy says she doesn’t care about the environmental issues concerning the nearby land. 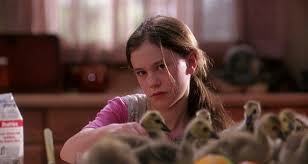 But she does care about the geese, and her actions end up stopping the destruction of protected land. I really enjoyed rewatching this film. As with most older movies, it made me want to look up all the actors and see what they’ve done since. If you haven’t seen it or just haven’t seen it in a while, I’d definitely recommend it. And depending on your tendency to cry, maybe keep a tissue close at hand. I was fine this time, but it was close. Posted on April 27, 2013, in Life, movies, reviews and tagged fly away home, movies, sick day. Bookmark the permalink. Leave a comment.